Herbs Plus, Chinese Medicine and Acupuncture. About us. Our team of consultants have all been trained and qualified in China and all have substantial experience in their relative fields. Mr Zhu is the senior consultant and has more than 24 years clinical and research experiences in Chinese and conventional medicine. • Deputy Director of National Chinese-Western Medical Infectious Diseases Treatment Research Centre (China). • Consultant herbalist, dermatologist and Deputy Director at the teaching hospital of Hunan University of Chinese Medicine, China. • One of the two key researchers on the project: ’The Clinical Research of Vitiligo with Chinese Herbal Medicine’, which won the 1995 Science & Technology Award of the National Health Ministry, China. • In charge of many Chinese medical research projects including the clinical and experimental observation of skin ulcers with external herbal remedies. His research results of radio-ulcerative dermatitis has been published in the national medical magazine, The Chinese Journal of Integrated Traditional and Western Medicine, No.2, 1994. • Worked for the last 10 years in London as a registered Chinese herbalist and acupuncturist in leading Chinese Medicine Clinics. • Member of the British Acupuncture Council and the Association of Traditional Chinese Medicine (UK). • During July 1995 and September 1998 Channel 4 television and Capital Radio interviewed him about Chinese medicine for libido and erection improvement. In the past 26 years he has treated several thousand patients with various complaints. Most conditions were remarkably improved. • He specialises in treating various skin problems, ME, Hair loss, tiredness, erection problem, infectious diseases, colic and indigestion. • Member of The NHS Directory of Complementary & Alternative Practitioners. Mrs Minli Wang graduated with honour degrees in TCM and Nursery from Shaoyang Medical School, Hunan Medical University, China. She had worked as a consultant acupuncturist, herbalist and Nurse-in-charge at second teaching hospital of Hunan university of TCM for over 10 years. As a senior TCM practitioner, Minli Wang specialises in acupuncture, cupping, beauty therapy and herbal medicine, with extensive experience of treating various pains, gynecological, pediatric and senile conditions such as menopause, menstrual pain, PMT, vaginal thrush and cystitis. Mr Liu is a well known TCM doctor and senior acupuncture lecture from Hubei Medical University of TCM. 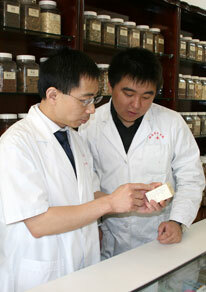 He has worked in a leading TCM hospital in Liaoning for 16 years and had been practising in UK since 2002. He has extensive experience in treating chronic conditions such as water retention, nausea, arthritic pain, high cholesterol, ME etc.